MARSEILLE, France, Sept 10, 2011 (AFP) - G7 rich nations vowed tough measures Friday to get the global economy back on track but were short on detail and admitted the problems were so complex that a unified response was impossible. The meeting in Marseille came as stock market turmoil returned to both the United States and Europe after the shock resignation of the European Central Bank's top economist fuelled fears over the continent's debt crisis. "We are committed to a strong and coordinated international response," the finance minsters and central bank governors of the group of industrialised nations said in a statement issued in the southern French city. Such action is needed to combat the slowing economic growth and the sovereign debt crisis afflicting both the United States and Europe that continue to rattle the financial markets, they said. They hailed the $447 billion (322-billion-euro) jobs plan unveiled Thursday by US President Barack Obama to energise the world's largest economy and praised European states' moves to rein in massive government debt. They also vowed to "take all the necessary actions to ensure the resilience of banking systems and financial markets." But there was little detail on how they would deliver on their promises and a senior US official said that a unified response was not possible given the widely differing circumstances in individual countries. Ministers and bankers from Canada, the United States, Japan, Germany, Britain, France and Italy went into the talks with the aim of preventing a repeat of the 2008-2009 recession. But they differed sharply on what approach to take. While the Americans were clearly plumping for stimulus, the Europeans were determined to railroad reform and austerity measures through parliaments. An Organisation for Economic Cooperation and Development (OECD) report issued on the eve of the meeting said a new recession in some rich countries could not be ruled out and warned that the eurozone crisis could deepen. International Monetary Fund chief Christine Lagarde warned there could be no foot-dragging about finding ways to boost growth. "The key message I wish to convey today is that countries must act now -- and act boldly -- to steer their economies through this dangerous new phase of the recovery," she said in London before travelling to Marseille. The world was suffering from "a crisis of confidence" amid heightened fears over the health of banks and sovereign debt, she said. "All this is happening at a time when the scope for policy action is considerably narrower than when the crisis first erupted," Lagarde said. "But while the policy options may be fewer, there is a path to recovery." The US package announced Thursday by Obama was aimed at giving a kick-start to the stalled American economy. The centrepiece is a deeper-than-expected $240 billion payroll tax cut for employers and employees meant to keep money in the pockets of those most in need, spur demand and encourage firms to hire new workers. Most European nations used stimulus spending to temper the effects of the recession that followed the 2008 financial crisis, but have now focused on cutting their deficits given their high debt loads. German Finance Minister Wolfgang Schaeuble said that taking a stimulus approach in Europe now would "aggravate the problems instead of resolving them." French President Nicolas Sarkozy, speaking in Paris, also said Europe was unlikely to follow the US example. When asked if Europe needed a similar plan, Sarkozy said: "No. A recovery plan, we're not going to be asking Greece to do that." Greece's European partners have been demanding that the country -- which benefits from a massive bailout to head off a government debt default that would weaken the euro -- slash state spending and raise taxes. But French Finance Minister Francois Baroin conceded that European governments must also go for growth. "We must tread the difficult path of achieving fiscal adjustment plans while supporting economic activity," he told reporters. 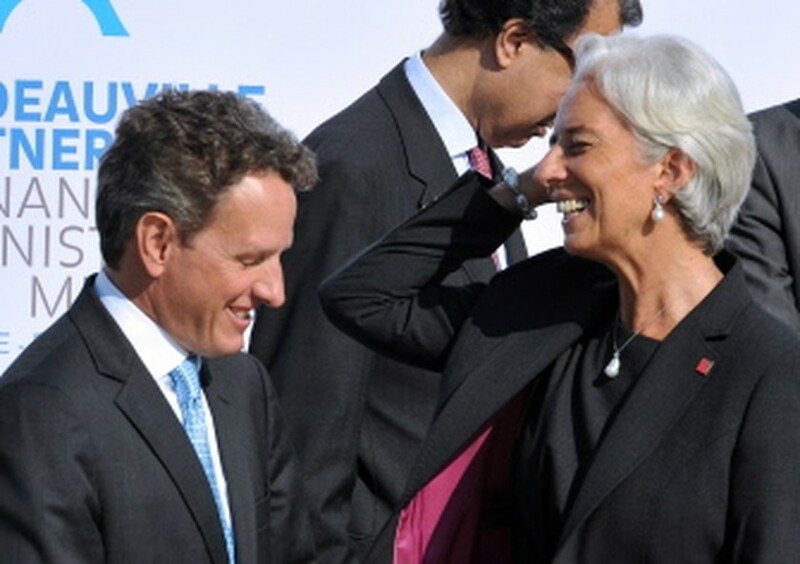 US Treasury Secretary Timothy Geithner said in Marseille that European states needed to do more to prove that they have enough political will to deal with the financial crises roiling the continent. "They've got more work to do in that area," he told Bloomberg Television, but he added that he was certain the single European currency would survive the current crisis. Libya's new rulers have also been invited to the Marseille meeting in a follow-up to the economic support for the so-called Arab Spring announced at a G7 meeting in May. The fledgling Libyan administration will on Saturday join Tunisia, Egypt, Morocco and Jordan as they explain how they plan to relaunch their economies and hear what help they can expect from the world's major powers.